Unite today (Tuesday 18 February) released Ireland Needs a Wage Increase. 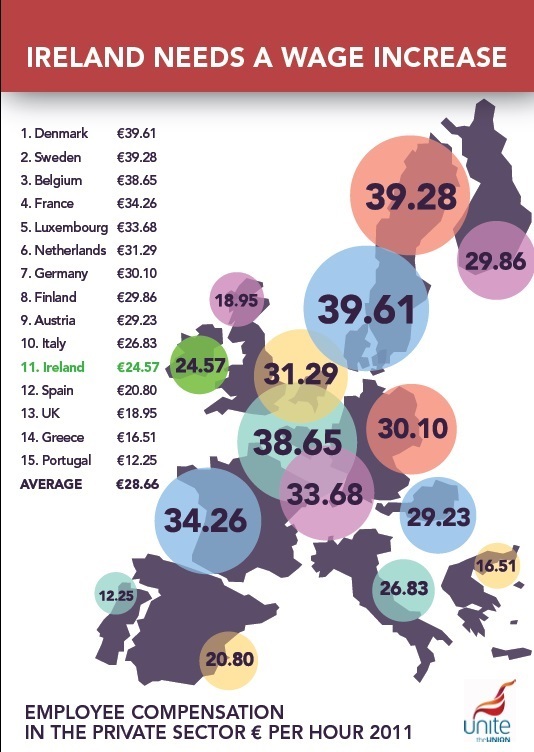 The document shows that Irish wages in the private sector are well below the average of most other EU-15 countries – and that the gap is particularly pronounced in low-paid sectors such as retail and hospitality. Unite’s research also shows that Irish productivity levels are well above the EU average, and that Irish labour costs make up a smaller proportion of total operating costs than in other European countries. “The research being published today drives a coach-and-four through arguments that wages are too high. “On the contrary: Irish workers’ wages are well below levels in other EU-15 countries, while productivity levels are well above both EU and Eurozone averages. “Low wages and six years of austerity are reflected in the fact that one in every five workers suffers multiple deprivation experiences. They are the working poor. “Unite’s research also shows that labour costs make up a smaller proportion of business operating costs than in other European countries, while Irish profits are rising faster than elsewhere in Europe. “Ireland needs a wage increase – not only to raise the living standards of workers and families, but also to put more money into cash registers up and down the country. “By vigorously supporting our members’ wage claims, Unite and the trade union movement are playing our part. But much more needs to be done. “Robust wage floors – in the form of an increased Minimum Wage, strong wage floors in the re-constituted JLCs and a public-procurement-supported Living Wage – are all necessary to ensure a sustainable wage-led recovery. “Unite is determined to ensure that 2014 is the year Ireland gets a wage increase”, Jimmy Kelly concluded. A two-page summary of the document is available here. This entry was posted in Press Releases, Republic of Ireland news and tagged Jimmy Kelly, low pay, Unite, wages. Bookmark the permalink.